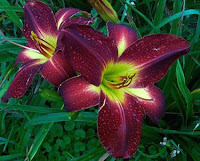 Daylilies were one of the last additions to my established flower beds. 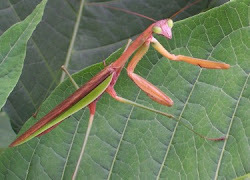 I hadn’t realized there were so many pretty colors & shapes, so since I’ve been bit by the daylily bug I have over 50. I’m not a serious collector by any means, nor will I ever spend over $30 on a fan, but I do enjoy all the daylilies I have collected in the last couple years. 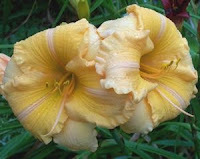 In 2004 I took pictures of these daylilies in hopes of someday being able to find out their names, so I could add them to my collection. I went back to the area and it’s now a subdivision so any help finding the names of these beauties would be greatly appreciated. 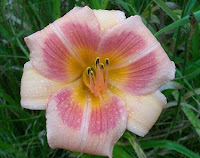 I figured I would upload the pictures on my blog incase an expert on daylilies is surfing the net someday. I don’t believe the daylilies below are anything fancy, but who knows. They sure are pretty.